Note: This page is provided solely as a convenience to the reader. This page is not legal advice. You should make use of the training and documentation provided by Afex. I disclaim any liability for real or imagined harms arising out of the use of Afex services or any procedures described on this page. The challenge with using Afex is that the user documentation is very limited and does very little to explain how to do things that an intellectual property firm might need to do. What is the problem for which Afex might be the solution? The chief problem that prompts a firm to consider using Afex is that some of the legacy service providers for foreign wire payment services impose very unfavorable foreign currency exchange rates and high wire transfer fees. I have blogged about this here and here. A related problem for some firms is that the firm’s own bank may charge a fee for receiving wire transfers from other countries. With Afex, incoming bank wires are free of charge. A transfer from one Afex customer to another is likewise free of charge to either party if no currency conversion is involved. The foreign currency exchange rates are, in our experience, strikingly more favorable than those of many other service providers. And if the destination for a wire is a foreign bank, the wire transfer fees with Afex are no higher than, and are sometimes less expensive than, those of other service providers. The most important part of Afex is your “Funding balances”. 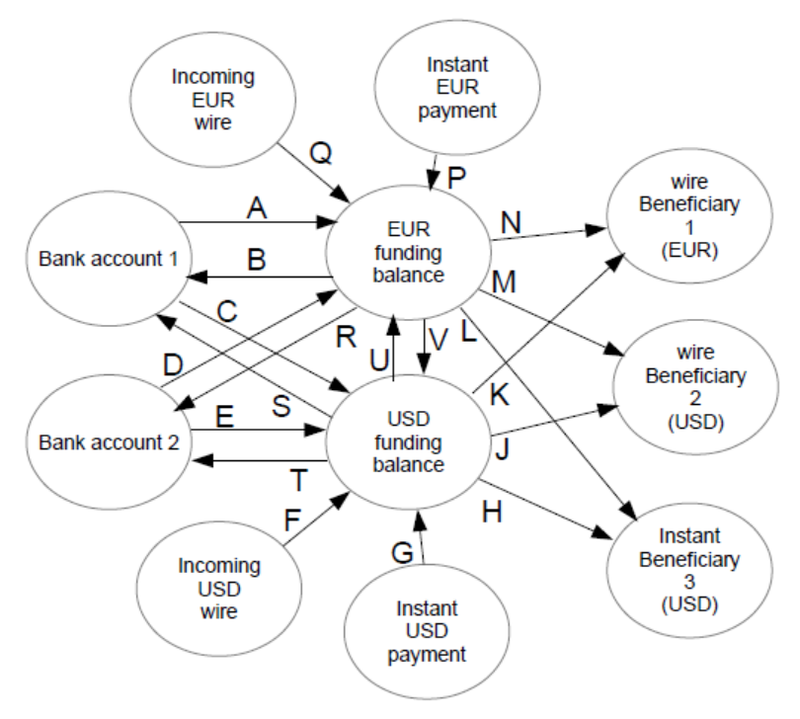 Each funding balance is in a particular currency such as USD or EUR. To use Afex it is necessary to have a funding balance in at least one currency, and you will probably find it convenient to maintain funding balances in several currencies. If you have only one funding balance, it will make sense for this funding balance to be in the same currency as that of your local bank account. Afex is not a bank, so the money in these funding balances is not FDIC insured. While it will make sense to keep some amount of money in one or more of your funding balances to serve various business purposes as discussed below, it is probably prudent not to leave large sums of money unnecessarily in your funding balances. In any Afex account there is always at least one “senior user”. A senior user can do anything. Your office workflow will probably work best if you set up at least one “junior user”. A junior user can carry out many basic tasks but cannot send money anywhere. The junior user can among other things submit a proposed transaction for approval by a senior user. It is prudent to have at least two senior users. This permits tasks to move forward even if one senior user is on vacation or gets a password lockout. The Afex system defines sixteen distinct roles, of which senior user and junior user are but two. The other fourteen roles offer a variety of combinations of types of access to various functions. You might possibly find that one of the other fourteen roles suits the needs of a particular person in your office. My guess is that in most firms, the most useful roles are the junior and senior user roles. To set up a new user, contact your partnership manager or portfolio manager at Afex. In any wire transfer system, including Afex, there is the concept of a “beneficiary”. The beneficiary is someone that you select from a drop-down list, to whom you are going to send money. This only works if there are beneficiaries on your drop-down list. You need to know how to “create a beneficiary”. In the Afex system there are two kinds of beneficiaries – “wire” and “instant”. Wire beneficiaries are the kind that we are all accustomed to from legacy wire transfer systems. Such a beneficiary is set up using multiple pieces of information including (typically) a Swift code, the name of a foreign bank, an account number at that bank, and depending on the country, as many as a dozen other pieces of information. If you select Afex to wire money to this kind of beneficiary, you will incur a wire transfer fee which Afex calls a “transaction fee”. The typical wire transfer fee with Afex is $5 or $15. The other kind of beneficiary is the instant beneficiary. This is a firm which, just like you or me, has an Afex account and has provided two pieces of information to you which permit you to set up that firm as an instant beneficiary. The two pieces of information are the Funding Balance ID mentioned above and an Account ID which is the same thing as the last four characters of the beneficiary’s Afex account ID. If you send money to such a beneficiary through Afex, the money arrives instantly and neither party incurs any fees. As I mentioned above, to set up a wire beneficiary, you need multiple pieces of information, and the types of information that you need differ from one country to the next. It can sometimes be a bit of a challenge to set up this kind of beneficiary. If you have in hand an invoice from a foreign intellectual property firm, by far the easiest way to set up that foreign firm as a beneficiary is simply to send the invoice to your contact at Afex. He or she will send it to someone at Afex who knows exactly what is needed for bank wires in the particular country involved. You are going to want to set it up so that you can draw money from at least one, and probably more than one, of your own bank accounts for use in the Afex system. To do this, talk with your Afex contact. Probably you will need to send at least one bank wire from your account to Afex as a way of proving that you have authority over the bank account. After that, you will fill out a form (in the US, an ACH form) and send it in. For a US intellectual property firm you will probably want to set up two such connections so that as needed, you can draw from either your trust account or your operating account. Your own bank might charge a fee for use of this connection, maybe the same fee that you would be charged for writing a check. If you have free checking, then maybe this would not incur a fee. You are going to want to set yourself up as a beneficiary in your Afex account. This way you can send money from your funding balances to your bank account. In the figure, you would set up a beneficiary for bank account 1 which would be used for transactions B and S. And you would set up a beneficiary for bank account 2 which would be used for transactions R and T. Hopefully your bank will not gouge you for an incoming ACH transfer. Hopefully this will be free of charge with your bank. Many of the screens that you will encounter require that you pick a “value date”. It seems that the “value date” is fancy language for “the date that the transaction will actually happen”. I sort of cannot figure out why anyone would ever want a value date that is anything other than the soonest possible date for the transaction to happen. Yet the Afex system will often default to a value date that is two business days later than the soonest possible date. Said differently, I nearly always find it necessary to click on the value date field so that I can manually set it to be the earliest possible date. The Afex system defaults to a single-factor authentication. For senior users, at least, you will want to set up two-factor authentication. Unfortunately it is SMS authentication. I hope that Afex will make it possible to use TOTP authentication. When a bank wire gets sent, the originator is able to send information to the beneficiary. This is like the “comment” line on a check. The name for this, from decades ago, is “OBI” (originator to beneficiary information). When you send a wire using Afex, you have an opportunity to put information into two “remittance” fields. Afex then puts that information into the OBI and sends it along with the bank wire to the beneficiary bank. Hopefully the beneficiary bank will pass this along to the beneficiary. When you are sending a bank wire, typically you would use the OBI to let the foreign firm know which invoices you are paying. Or if you are paying fees to an International Searching Authority or International Preliminary Examining Authority, you would use the OBI to say which PCT application is involved. If you are paying fees to the International Bureau, you would use the OBI to identify the PCT application or Hague application or Madrid application that is involved. When you are receiving a bank wire through Afex, the critical information that needs to be in the OBI is your Afex account number. For any given incoming wire, you will not receive much information from Afex other than the amount of wire and maybe a hint at who the sender is. Sometimes you will be able to guess who sent the money and sometimes you will be able to guess which of your invoices are intended to be credited. Otherwise, just drop a note to your Afex representative who can obtain the entire OBI and forward it to you. The spot-forward screen permits you to do lots of things. Most broadly speaking the reason that you are on this screen is that there is something or another that you want to do in some currency and you do not have enough money in that particular currency to do whatever it is that you want to do. So you will be doing a currency conversion. Even though you don’t have enough funding balance in the desired currency, what if you do happen to have enough funding balance in some other currency? If so then you could carry out the transfer by specifying that you are “selling” the currency of the funding balance where you have lots of money, and you are “buying” the currency that is intended to be paid to somebody. The “pay Afex via” would be the funding balance in the currency that you are selling, denoted by “wire”. Otherwise the source of funds would be an ACH draw from your bank account which is, for example, in USD. If so then you could carry out the transfer by specifying that you are “selling” the currency of your bank account, and you are “buying” the currency that is intended to be paid to somebody. The “pay Afex via” would be an ACH from your bank. The spot-forward screen permits you to do yet another thing, which is to move money back and forth between your funding balances. If this is your goal, then you specify that you are “selling” the currency of one of your funding balances, and you are “buying” the currency that is intended to go into another one of your funding balances. The “pay Afex via” would be the funding balance in the currency that you are selling. And you check the box for “funding trade”. Yet another use of this spot-forward screen is to load money into some non-USD funding balance, drawing the funds by means of an ACH from your bank account which is, for example, in USD. If so then you could carry out the transfer by specifying that you are “selling” the currency of your bank account, and you are “buying” the currency that is intended to be loaded into your funding balance. The “pay Afex via” would be an ACH from your bank. And you would check the “funding trade” box. So to summarize, the spot-forward might draw funds from one of your funding balances. Or it might draw funds from one of your bank accounts. And the spot-forward might send funds to a beneficiary. Or it might simply send funds to one of your funding balances. The other transaction screen besides spot-forward is scheduled-payment. The scheduled payment screen is of no help if the thing you want to do requires some particular currency that you do not already have enough of to do whatever it is that you want to do. Even if the thing you want to do is in USD and you have an ACH link to your USD bank account, the scheduled-payment screen is of no use. The only way that the scheduled payment screen helps is if (a) the thing you want to do is send some money to a beneficiary in a particular currency and (b) you happen to already have at least that much money in that particular currency in your funding balance. Sometimes you want to do something pretty simple namely to load money into your funding balance from your bank account. If so, then one way to do it is go to the home screen. Click on the flag of interest in the “add funds” column. Pick how much money you want. Indicate “ACH” as the source of funds. In the simple case where your bank account is in the same currency as your desired funding balance, there will be no currency conversion fee. I will now talk through a variety of transactions which you might wish to carry out, and for each, I will describe where to click in the Afexdirect user interface to make it happen. A. Loading money from your own bank account 1 into your EUR funding balance. Let’s suppose your bank account is in USD. This task involves drawing money from your bank account. This task also involves carrying out a currency conversion. Click on Transactions/Spot-forward. Select that you are buying EUR and selling USD. Indicate whether you want the size of the transaction determined according to the number of Euros or according to the number of Dollars. Enter the number of Euros or Dollars. Check the box “funding trade”. The fact of the “funding trade” box being checked clears out any beneficiary selection that you might have made. Pick a “value date”. Click “get quote”. If you like it, then click “buy”. For this transaction you will not be charged any wire transfer fees. B. Sending money from your EUR funding balance to your bank account number 1 (which I will assume is a USD account). This assumes that you have already set up bank account 1 as a beneficiary. Go to Transactions/Spot-forward and select that you are buying USD and selling EUR. Select the beneficiary that is your bank account number 1. Indicate whether you want the size of the transaction determined according to the number of Euros or according to the number of Dollars. Enter the number of Euros or Dollars. Pick a value date. Click “get quote”. If you like it, then click “buy”. For this transaction you will not be charged any wire transfer fees. Go to the home screen and go to the “add funds” column and click on the flag icon of choice. The screen that pops up will be a spot-forward screen. Alternatively, go to transactions/spot-forward. Select that you are buying USD and selling USD. Check the box “funding trade”. Proceed as described above for tasks A and B to fill in the blanks. D. This is just like task A.
E. This is just like task C.
F. The idea here is that someone sends you a bank wire in USD. They will do this by following detailed instructions provided to you by your Afex contact. The money will go to a particular bank. Importantly you are not the beneficiary. The beneficiary is Associated Foreign Exchange. The way that you get the money is that the sender will mention your Afex account number in the OBI (comment) field of the bank wire. You will not incur any wire transfer fee. There is no currency conversion fee. This money will end up in your USD funding balance. Alternatively maybe you would like to make it easy for someone to send you a bank wire in some other currency. To do this, ask your Afex representative for “incoming payment instructions” for whatever currency you like. You will need to set up a Funding Balance in that currency if you have not already done so. Again you will be able to receive the wire free of charge. G. The idea for this transfer is that some foreign intellectual property firm that is an Afex customer has set you up as an instant beneficiary. They did this using your USD funding balance ID and your Account ID. Their payment reaches you instantly and neither party pays any bank fee. There is no currency conversion fee. This money will end up in your USD funding balance. H. The idea is that you wish to pay some foreign intellectual property firm that is an Afex customer. You have set them up as an instant beneficiary. You did this using their USD funding balance ID and your Account ID. Your payment reaches them instantly and neither party pays any bank fee. There is no currency conversion fee. This money will end up in their USD funding balance. Alternatively maybe you want to pay an instant beneficiary in some currency that is not USD. The foreign IP firm will give you a funding balance ID that is for a funding balance in whatever currency they choose. You then set up an instant beneficiary that is in that currency. If you have a funding balance in that currency, you could do an instant payment and there will be no currency conversion fee and no bank fee. See also transfer L in which your source of funds for the instant beneficiary your funding balance in some currency that does not match the currency of this instant beneficiary. In that case you would incur a currency conversion fee but not a bank wire fee. J. The idea here is that you are paying a wire beneficiary that is expecting to receive USD. You could pay them from your funding balance if you have enough USD in your funding balance. One way to do this is to select transactions/scheduled-payment. Pick the currency, then pick the beneficiary. Pick a due date. Depending on the destination you may have the opportunity to pick either of two delivery methods. Another choice would be to use a funding balance that is not USD. You would do this through transactions/spot-forward. If you have, say, a lot of Polish Zlotys in your funding balance you could pick that you are selling Zlotys and buying USD. Pick the beneficiary. You would then incur a currency conversion fee and a bank wire fee. Alternatively you could pick a source of funds that is your own USD bank account. If so then you are doing a transfer E and also a transfer J.
K. The idea here is that you are paying a wire beneficiary that is expecting to receive EUR. You could pay them from your funding balance if you have enough EUR in your funding balance which would be transfer N.
But here with transfer K the assumption is that you want to use your USD funding balance. So you will have to select transactions/spot-forward. You will pick that you are selling USD and buying EUR. And pick the beneficiary. You will end up with a currency conversion fee and a bank wire fee. Alternatively you could pick a source of funds that is your own USD bank account. If so then you are doing a transfer E and also a transfer K.
L. The idea here is that you have a EUR funding balance and you would like to use it to pay an instant beneficiary that is expecting to receive USD. So you will have to select transactions/spot-forward. You will pick that you are selling EUR and buying USD. And pick the beneficiary. You will end up with a currency conversion fee but no bank wire fee. M. This is just like L except that the beneficiary is a wire beneficiary instead of an instant beneficiary. The steps are all the same except that you will also incur a bank wire fee. N. The idea here is that maybe you are so lucky that you have a big enough EUR funding balance to cover a transfer that you want to make to a EUR beneficiary. To do this you can do your choice of a transaction/spot-forward or a transaction/scheduled-payment. The reason you can use the transaction/scheduled-payment is that there is no currency conversion involved. Or you could use transaction/spot-forward and pick that the buy and sell currencies are the same. Another possibility is that you do not have enough EUR funding balance to cover the transfer. In that case you would draw upon your USD bank account and do a transfer A or D along with the transfer N. This incurs a currency conversion fee as well as a bank wire fee. P. The idea is that some foreign intellectual property firm that is an Afex customer has set you up as an instant beneficiary in their Afex system. They did this using your EUR funding balance ID and your Account ID. Their payment reaches you instantly and neither party pays any bank fee. There is no currency conversion fee. This money will end up in your EUR funding balance. Q. The idea here is that someone sends you a bank wire in EUR. They will do this by following detailed instructions provided to you by your Afex contact. The money will go to a particular bank. Importantly you are not the beneficiary. The beneficiary is typically Associated Foreign Exchange. The way that you get the money is that the sender will mention your Afex account number in the OBI (comment) field of the bank wire. This money will end up in your EUR funding balance. You will not incur any wire transfer fee. There is no currency conversion fee. R. The idea here is that you have some EUR in your funding balance and you have decided you want to send it to your USD bank account. To do this you will do transactions/spot-forward. You will sell EUR and buy USD and the beneficiary is yourself. S. The idea here is that you have some USD in your funding balance and you have decided you want to send it to your USD bank account. To do this you have your choice of using transactions/spot-forward or transactions/scheduled-payment. If you pick transactions/spot-forward then you will sell USD and buy USD and the beneficiary is yourself. 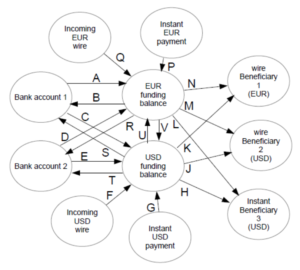 The source of funds (“pay afex via”) would be “wire”. The other choice is transactions/scheduled-payment. Again the beneficiary is yourself. T. This is just like S.
U. You have money in your USD funding balance and you want to move it into your EUR funding balance. Of course this will incur a currency conversion fee. You pick transactions/spot-forward and you are selling USD and buying EUR. Your “pay afex via” is “wire”. You check the box for “funding trade”. There is no bank wire fee. Alternatively maybe you want to load some Euros into your EUR funding balance, drawing from your USD bank account. Of course this will incur a currency conversion fee. You pick transactions/spot-forward and you are selling USD and buying EUR. Your “pay afex via” is “ACH”. You check the box for “funding trade”. There is no bank wire fee. V. You have money in your EUR funding balance and you want to move it into your USD funding balance. Of course this will incur a currency conversion fee. You pick transactions/spot-forward and you are selling EUR and buying USD. Your “pay afex via” is “wire”. You check the box for “funding trade”. There is no bank wire fee. For some firms a situation will sometimes arise where a client wants to know exactly what it will cost (in local currency) to carry out some task in a foreign country. The client is going to pay now, into your trust account, so that two or three months from now you are able to pay the invoice from the foreign firm (which is in some currency that is not your local currency). The problem of course is that the currency exchange rate may change during that two or three months. How can you protect yourself from an adverse shift in the exchange rate? The answer is quite simple, as I will illustrate by example assuming that your firm is in the US. Suppose the task to be done is a task in Poland, denominated in zlotys. The Polish firm has quoted 2000 zlotys for the task. Assuming that the work gets carried out in Poland, you will be paying an invoice in zlotys a couple of months from now. And right now is when the client needs to advance some number of US dollars to your trust account. Just now many US dollars should you ask for? Go to your home screen which shows your funding balances. Maybe you already have a funding balance for zlotys, but if not, click on the link to add this funding balance. Now simply buy 2000 zlotys. This might be done like the task U in the figure, in which you use some USD in your USD funding balance to buy some zlotys which end up in your zlotys funding balance. Or if you prefer, you can carry out task A or D in the figure, drawing money from your own USD bank account and using that money to buy some zlotys which end up in your zlotys funding balance. Later, when the time comes to pay the invoice from the Polish firm, you pay that firm using the zlotys in your zlotys funding balance. No currency conversion is involved, so there are no surprises in the cost. But wait, you ask. What if the client gets cold feet and never actually advances the funds? In that case you will of course refrain from authorizing Polish counsel to proceed, and you will never actually receive that invoice from the Polish firm. But won’t you now be stuck holding 2000 zlotys that you don’t need? Yes, you will. But this is not as big a problem as it seems. You could always simply convert the zlotys back into dollars, for example as task V or B or R. Yes this will lose a little money on two currency conversions. But this will not sting as much as it would with some service providers since (at least in our experience) the currency conversion premiums charged by Afex are strikingly less bad than those of many other service providers. And if the task you choose is task V, there will be no ACH fee or wire fee incurred. The remaining concern is, of course, that as a matter of cash flow you are locking up 2000 zlotys in this funding balance for a couple of months. Yes this is money that could have earned interest had it been in a bank account. For some destination countries you will see that you get to choose whether the money gets sent with a “high value” fee or a “low value” fee. If you pick high value, the fee you pay will be larger, typically $15. If you pick low value, the fee you pay will be smaller, typically $5. How should you choose? What our Afex contact tells us is that if you pick high value, then there are more kinds of tracking information available to Afex to try to troubleshoot if something seems to have gone wrong with the bank wire. We are also told that sometimes if you pick low value, this will mean that it takes an extra day or two for the money to reach its destination. My suggestion is that if the transfer that you are setting up is the first transfer that you have ever sent to a particular beneficiary, use the high value choice. The idea here is that whoever set up the beneficiary in the first place could conceivably have mistyped something or omitted some necessary field of information in the setup. In contrast, if in the past you have successfully sent at least one or two transfers to a particular beneficiary, then this suggests that probably nothing was mistyped or mistakenly omitted from the setup. Now that you know that the beneficiary was apparently set up correctly, maybe you can give yourself permission to take a walk on the wild side and drop down to the low value fee. Instant beneficiary. In the happy case where you and your foreign colleague both have Afex accounts, by far the best way to do the transfer is by means of instant beneficiary. IBAN. All banks in Europe, and some banks in other countries, find it very convenient to send a money transfer to an IBAN. For them, you would want to give them bank wire instructions that permit the use of an IBAN. It happens that Afex has a bank account in the UK that can receive transfers via IBAN. ACH. If your sender is using a bank in the US, then by far the least expensive way for your sender to send money to you (cheaper than a Swift transfer) is ACH. For this, the sender needs only your ABA routing number and bank account number, and will not need to use a Swift code. SWIFT. The remaining option, if the previous three approaches are all unavailable to your foreign colleague, is the use of a SWIFT transfer. This has the drawback that it will probably cost your colleague more money (in terms of bank fees) than any of the previous three approaches. Here is a typical wire instructions letter for use with inbound wires in US dollars. The letter would be different for other currencies.